Looking for a job has become less of a hassle because of the internet. Users can job search daily, without leaving the comfort of their own home or head to the local library. 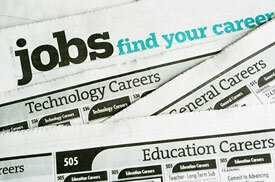 According to a new study by the Phoenix Center, internet users are 50 percent less likely to give up on a job search. The Phoenix Center is a non-profit 501(c)(3) organization that studies broad public-policy issues related to governance, social and economic conditions, with a particular emphasis on the law and economics of telecommunications and high-tech industries.